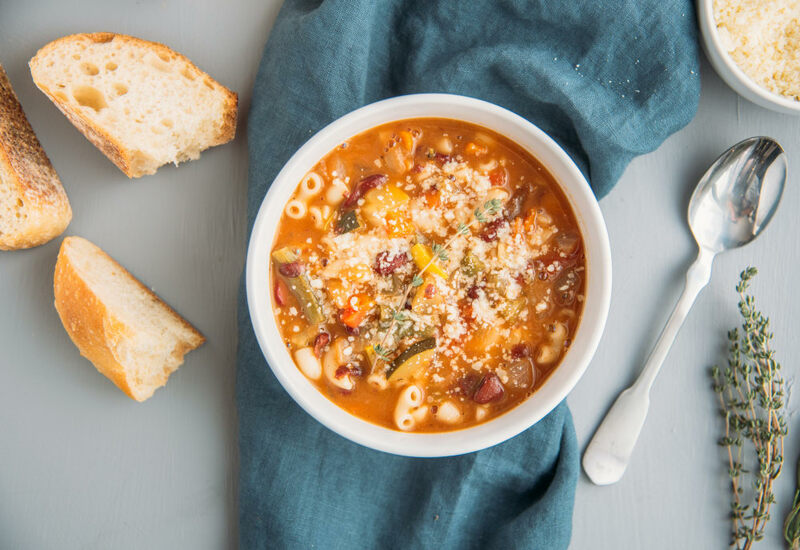 End your busy day with a hearty bowl of minestrone soup that is loaded with veggies and fresh herbs. It's done in under an hour, making it a great option for weeknight meals. This recipe has it all! An array of colorful fresh veggies like, carrots, celery, zucchini, yellow squash, and green beans. There's also red kidney beans for additional fiber and protein. Herbs like thyme, rosemary and basil keep it fresh, while a cup of elbow macaroni keeps it fun! Serve with warm crusty Italian bread and a dash of freshly grated Parmesan cheese melting on top. This recipe adapts well to different vegetable combinations. Try using this recipe as a base and incorporate your favorites or whatever is in season. Per Serving: 147 calories; 3g fat; 24.8g carbohydrates; 6g protein; 0mg cholesterol; 997mg sodium. Tasty soup. There's no mention of Parmesan cheese in the recipe but feel free to add it because ... hello Parmesan cheese 🧀 is everything! This minestrone recipe is a classic! Perfect cold weather soup and full of flavor. I really love the thyme and rosemary with it, so aromatic. Meal prepping today and made a double batch for the fam. It’s delicious!! I tossed in some leftover kale to the mix. AY LMAO this fills the tummy and its so yummy.